The 108th Ammunition Train, in which Harold, Cyril, and Oliver Ward all served, took part in the two-month long Battle of the Argonne Forest, part of the last Allied push along the Western Front in the fall of 1918. On October 8, Oliver was killed in an ammunition attack, just 33 days before the Armistice of Compiègne ended fighting. He was 21 years old. 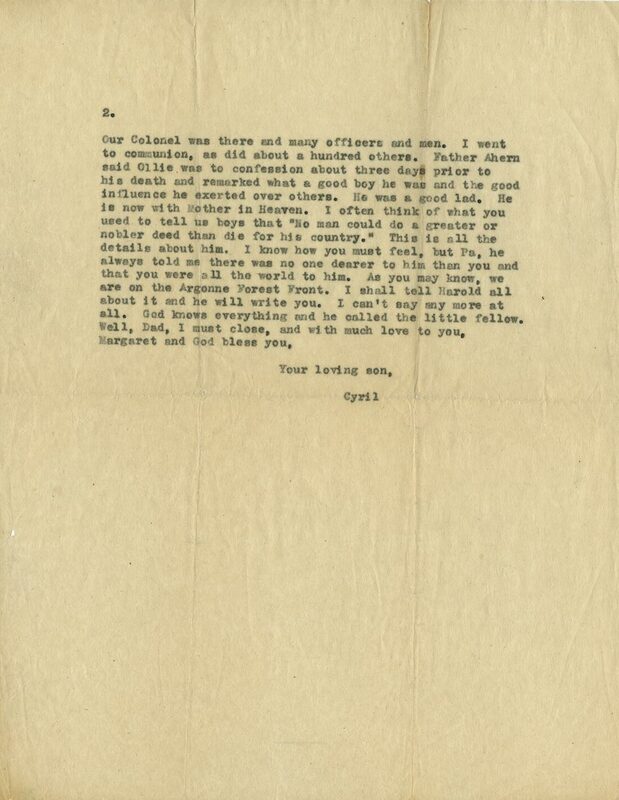 Cyril wrote to his father following his brother’s death, assuring him that Oliver had recently been to confession and believed that “no one could do a greater or nobler deed than die for his country.” Cyril and Harold Ward were both honorably discharged by June of 1919. 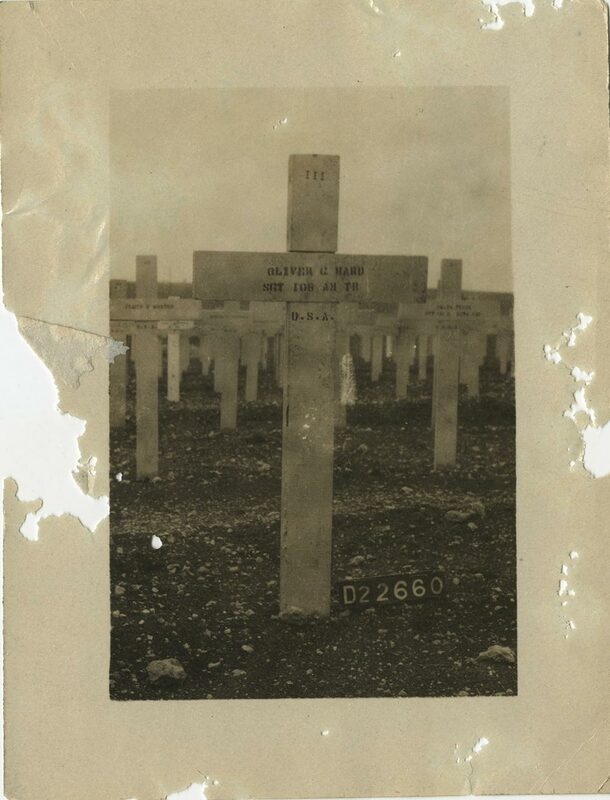 First buried near the battlefield, Oliver’s remains were moved to the Argonne Cemetery in France in 1919. Fr. 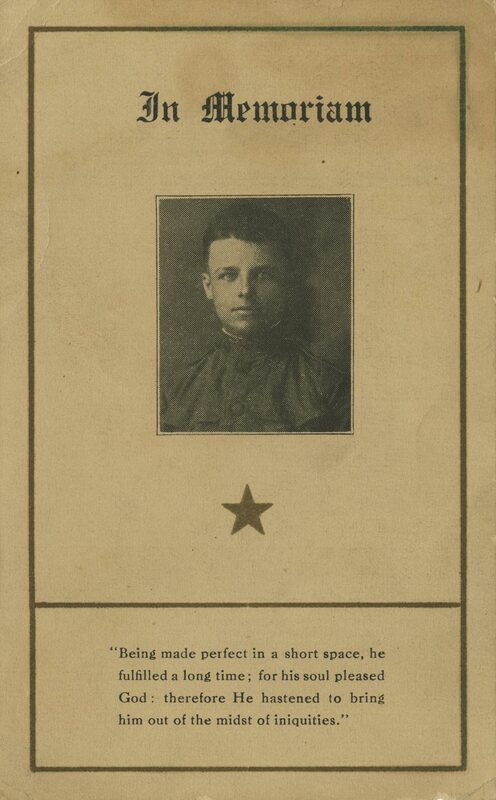 McCabe held a military mass for Oliver at St. Vincent’s Church in November of 1918. 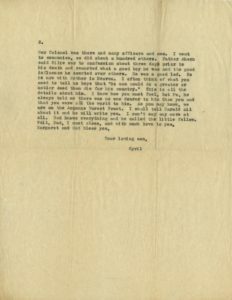 In his sermon, he quoted from a letter that Oliver’s brother, Albert, wrote to a DePaul professor: “Wasn’t that glorious news about Oliver? I wish I were in his place. 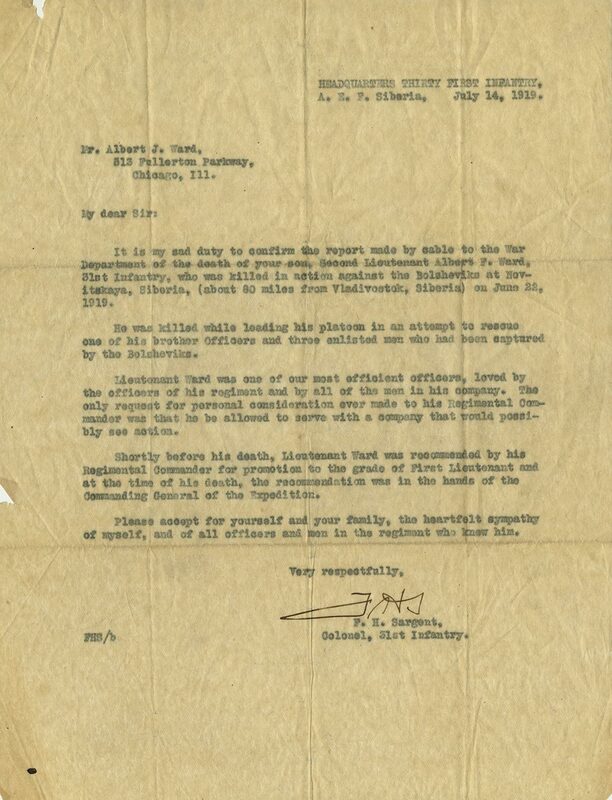 Just think, Father, a saint as well as a soldier!” Albert’s response to his brother’s death reflected the same faith and patriotism that Fr. 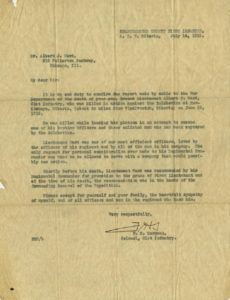 McCabe had expressed in his letter to the YMCC. After World War I concluded in Europe, nearly 9,000 American troops were sent to Siberia to bolster Allied units against Bolshevik forces fighting in the Russian Civil War. 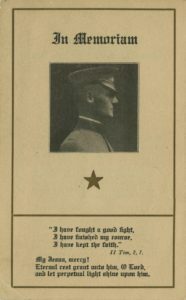 Albert F. Ward, a lieutenant in the 31st Infantry Regiment, was killed leading an attempt to free four men captured by enemy forces on June 22, 1919. He was 24 years old. 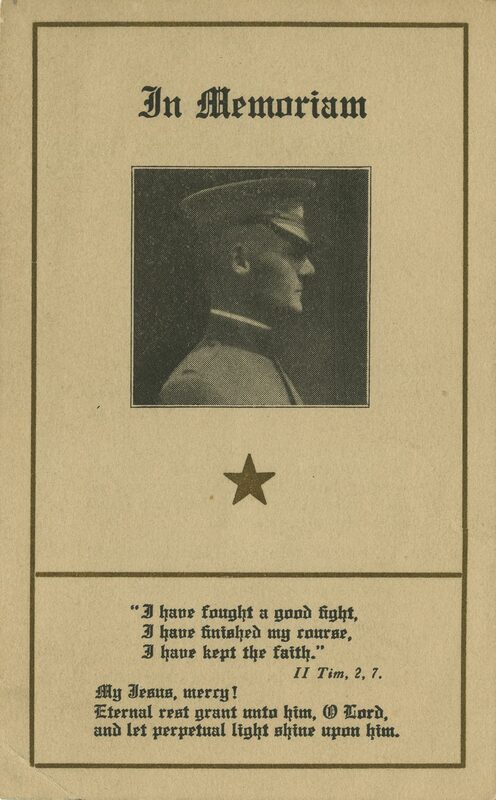 The letter at right describes his death, while the Commencement edition of the 1919 Minerval covered his life. The newly ordained Rev. 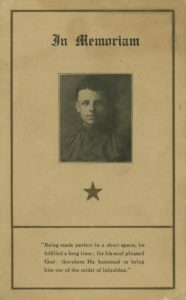 William Ward, C.M., led a funeral service for his younger brother Albert at St. Vincent’s Church in October of 1919, with Ferdinand “Joe” Ward acting as subdeacon. Their brother’s mass was one of the first public services Fr. William Ward and the soon-to-be-ordained Fr. Joe Ward performed.